We're back again with another selection of five of our favourite tech stories of the last day, plucked carefully from the news feeds of TechRadar. 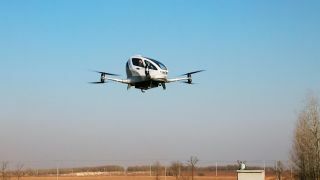 Read on to learn about the latest hot gadgets of the day – and to see the latest in autonomous, people-carrying air taxi tech. Smartwatches don't have to be expensive, as the newly unveiled Huami Amazfit Bip proves – costing $99 (about £70, AU$120), it can give you up to 45 days of battery life, which compares very well with the much more expensive Apple Watch that needs charging every evening. You get intelligent sleep and sports tracking, while GPS and heart rate sensing are built in too. It's on sale in the US now, with no news yet on global availability. Kudos to you if you've managed to keep up with Sony's smartphone launch strategy in recent years and actually made sense of it, but it sounds like there's another twist in the tale with the imminent launch of the mysterious Sony Xperia XZ2 just a few months after the Xperia XZ1 appeared. That's based on an errant tweet from a phone network though, not from Sony, so we'll have to wait and see – an end-of-February launch would be likely. The idea of self-piloting air taxis transporting us through the skies sounds very much from the realm of science fiction, but it's getting closer to science fact. Chinese drone maker Ehang has been showing off its Ehang 184 air taxi in private tests, and apparently it's been able to cope with short journeys in multiple weather conditions with... er... flying colours. Of course there are a host of regulatory issues here too, but the future is arriving fast. Intel is working on some smart specs that actually look like normal glasses rather than a prop from a sci-fi movie, and they might just be plain enough to catch on. There's no camera here to record anything, but there is a tiny projection system to beam important information and notifications right into your eye. These specs are called Vaunt, but as yet Intel hasn't got anything else to share, so we don't have a price or release date so far. Nothing beats playing games in the same room as other people, but the problem is finding enough screen space for everyone to be happy with – even the biggest displays don't cope all that well with split-screen gaming. Enter the MirraViz MultiView Display System, which can play multiple video sources at the same time, and directs the photons or light to particular parts of the room, so all of the players present can enjoy a full screen view.